H&M has been providing on-trend, sustainable fashion to the UK since it first opened its doors to the British high street back in 1976. Offering something for everyone, you can shop from a vast range of styles and trends; from clothing and shoes, to accessories and homeware at fantastic prices. If you apply an additional discount that reduces your overall purchase price, this may cause your reward to be declined. No rewards if you pay for your purchase using gift card. 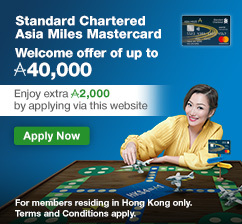 ©2019 shop.asiamiles.com is managed and operated by Asia Miles Limited.